Intelligent data management via the internet. You´re looking for an inexpensive solution to control and maintain your machinery and equipment via a secure internet of things or cloud platform? 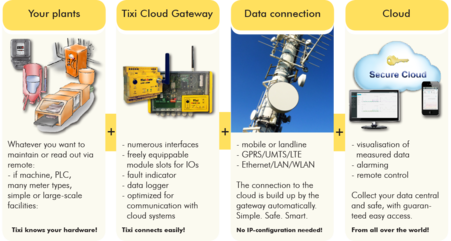 Place your trust in Tixi Cloud Gateways and rely on our over ten years of experience in the areas of M2M and smart metering. Analyse and optimize your production processes from afar and save costs. Keep your entire plant in view at any time - from all over the world! Simple. Safe. Smart. A textbook example of industry 4.0. Controll of the vital functions and direct report in case of deviation or fault, with automated SMS or e-mail to your service staff. 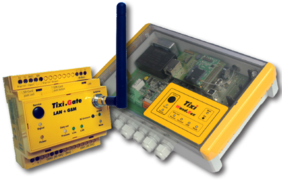 Tixi systems log fast and reliable and are able to adapt logging parameters and intervalls at different scenarios. Localization of your devices via a GPS-feature. including monitoring of all processes. Cost optimisation of time-, way- and personal-consuming routine works, like reviewing machines, plants and reading out data. Highest data security by the use of encrypted communication. Access to your data with your smartphone or tablet-pc. Open interfaces for connectivity to different cloud solutions. The connection to the cloud takes place without any configuration - automatically after power up. Simple. IT know-how is not necessary.